We still mean to get more of our Guatemala photos up, but for now, a recipe inspired by our trip: poblanos, charred, peeled and stuffed with a filling of chorizo, potato and cilantro, served with a slightly spicy, smoky chipotle salsa. Let me start off by affirming this is not an authentic Guatemalan recipe, nor is it a true chile rellenos, as the latter are typically fried in a batter. 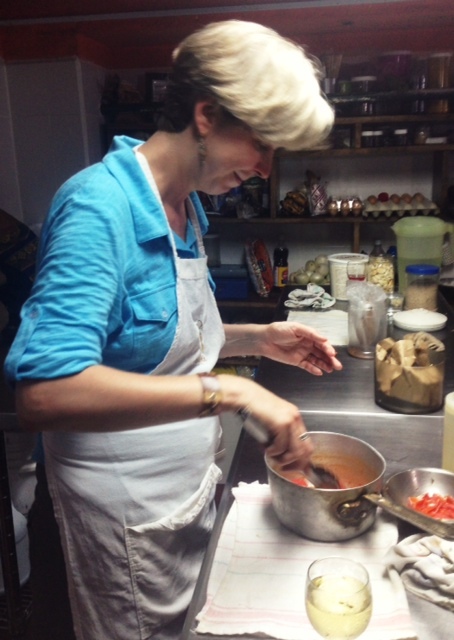 However, several of the techniques and ingredients I used are a direct result of the absolutely fantastic cooking class we took in Antigua, at Frijol Feliz cooking school, which operates out of Café Flor, a restaurant we heard was excellent but never got to try on its own. 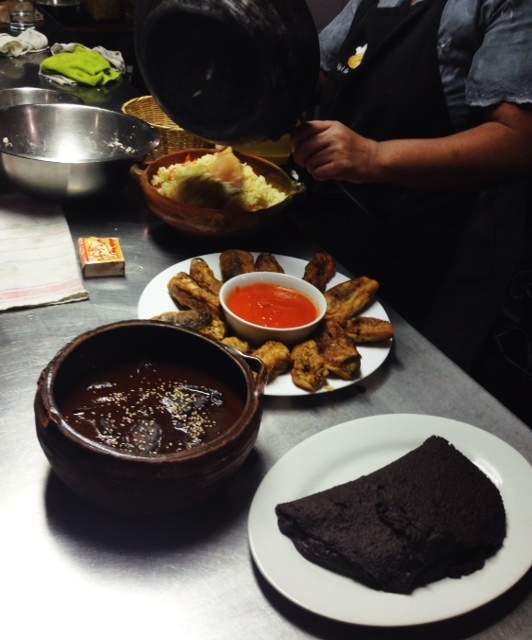 Felicia, our teacher and chef, led us through a menu of Guatemalan dishes: chile rellenos con salsa de tomate, frijoles volteados, mole platanos, as well as a traditional rice dish and homemade corn tortillas. The fact that Felicia spoke only Spanish mattered little, as we knew just enough to understand to cut something much smaller (“¡mas pequeño!“), or cook the vegetables in unsalted water, or let the onions fry longer. One of the best things about the class was simply watching Felicia move about the kitchen with confidence, never measuring but always checking, tasting, adjusting, perfecting until she was satisfied with the result–no small feat when she had four “helpers” (another couple took the class with us*) underfoot chatting and sipping wine and snapping a photo or two in an attempt to learn and remember as much as they could. 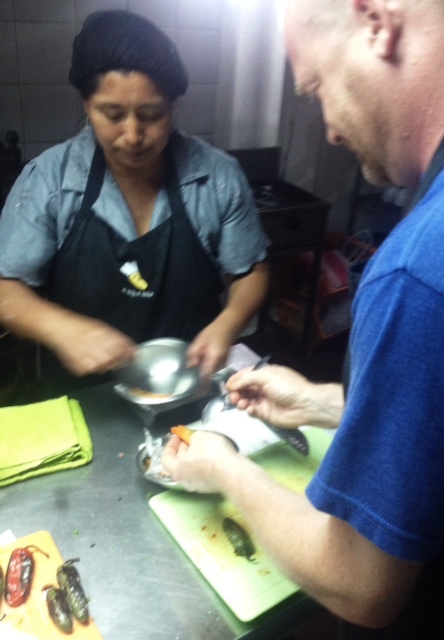 We learned that the salsa for the stuffed peppers is made by cooking a few simple vegetables in water, then pureeing and finishing in a saucepan. It’s an incredibly simple technique that I’ve stolen and changed ever so slightly, by adding in a canned chipotle for a little heat and smokiness. Otherwise, it’s Felicia’s salsa. The stuffing was a revelation, too: onion, carrot and green beans (green beans! who would have thought?!) chopped as small as humanly possible–no food processor in Felicia’s kitchen–and then simmered in water, the same water a whole potato was cooked in earlier. The potato was destined for the filling, too, after being peeled and chopped into very small cubes. In all, the techniques Felicia demonstrated were elegantly simple, from the efficiency of cooking each step of the filling in the same pot of boiling water, one after the other (poaching chicken was the start), to the ease of the batter for the peppers: eggs, separated and whites whipped, then yolks whipped in to form a light-as-air coating that fried up in just a couple of minutes in a shallow frying pan. For this recipe, I did not batter and fry the poblanos, mainly because I was bringing a large pan of these to a group dinner with friends (double the recipe below), and needed to make them ahead. But I do intend to test Felicia’s easy egg batter method as soon as I can. At first glance, this may seem like a lot of work, but it can easily be done in stages over a couple of days. It can be doubled or tripled for a crowd or future meals, too, so if you’re going to the effort you might as well make a bunch. Believe me, you won’t regret having leftovers. Char poblanos until blackened on all sides. 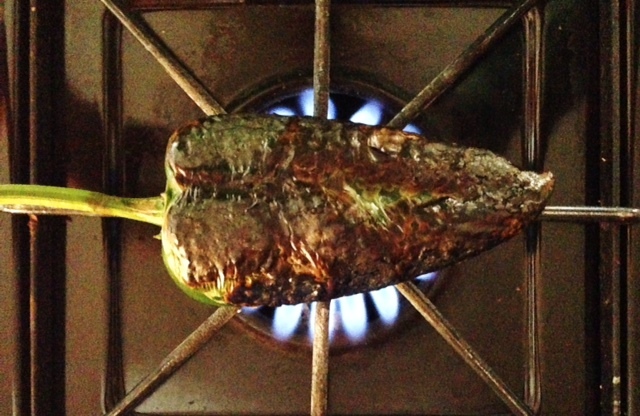 I char my poblanos right on the stovetop, over the gas burners. If you have a method you prefer–outside grill, under the broiler–feel free to use that method. Place in a large bowl and cover tightly with plastic wrap. Leave to steam for about 20 minutes, after which time they should be cooled enough to handle. Peel the charred skin from all the peppers. 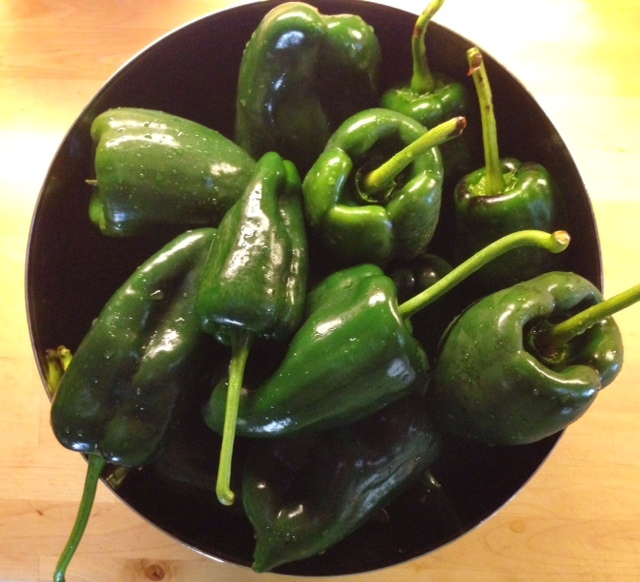 Take each pepper, and with a small knife, make a vertical slit in one side from the stem to the bottom. Gently reach in and try to grab the seeds with one hand and remove (you won’t get them all, don’t worry). Use the knife to remove any veins that are hanging loose. Take the peppers and gently rinse them under cool water to remove any remaining seeds from the inside, and set on a towel to dry a bit while you make the stuffing. Cut potato in half and cook in small pan of boiling water, until tender. Remove from water and set aside to cool a bit before peeling, and chopping into very small cubes. (This water could be used to continue with the salsa recipe, below). When vegetables are cooked, place in a large bowl and allow to cool slightly. Add sausage, potato, cheeze and chopped cilantro to the bowl, mixing until everything is thoroughly combined. (This can be done ahead to this point, and refrigerated for a few hours (or up to a day, well covered) until ready to stuff the poblanos). Preheat oven to 350, and cook peppers on middle rack until heated through, 20-30 minutes (the longer time if they’ve been refrigerated a while before cooking). Serve on a bed of the sauce (recipe below), topped with crumbled queso fresco and extra chopped cilantro, if desired. If serving as an entree, black beans–whether frijoles volteados or just simmered in a pan–make a great side and round out the meal. Cut the tomatoes in half, and cut the onion and pepper into a couple of pieces each. Add to a small saucepan with just enough water to cover. Bring to a boil and simmer about 10 minutes. Remove from heat, and carefully remove vegetables from the water. Don’t discard the water. Remove peel from the tomato halves (tongs work great for this) and add vegetables to a blender along with the chipotle and a little adobo sauce from the can (depending how spicy you want it). Add a little water from the pan–enough so it will blend easily (for me, this was about half way up the vegetables in the blender jar). Puree a few minutes until the sauce looks smooth. Sauce can be made ahead to this point, refrigerated and finished later/another day. Discard the rest of the water, and add the sauce back into the same pan. Simmer over medium low heat for about 10 minutes, until heated through (simmer longer if you want a thicker sauce). 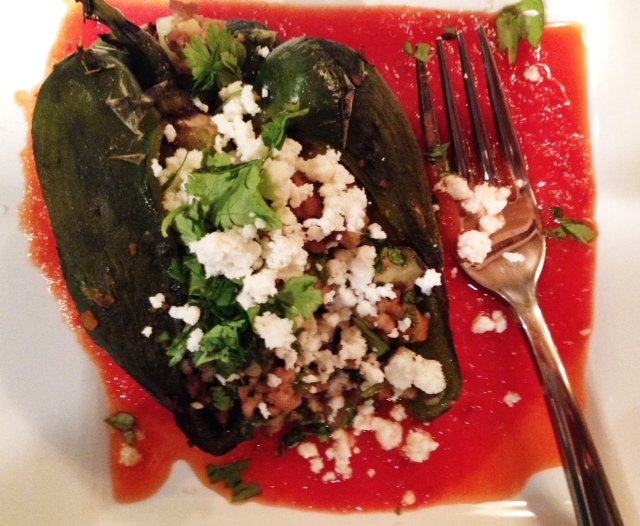 Serve with the poblanos. *Coincidental twist of fate: The other couple in the class with us were Chad and Kimberly, whom we had met briefly the day before as we were all checking out of our previous hotel at Lake Atitlán. We shared a boat to Panajachel, talking about places we’d been around the lake in our short time there, then bid farewell as we each caught our separate car to Antigua. 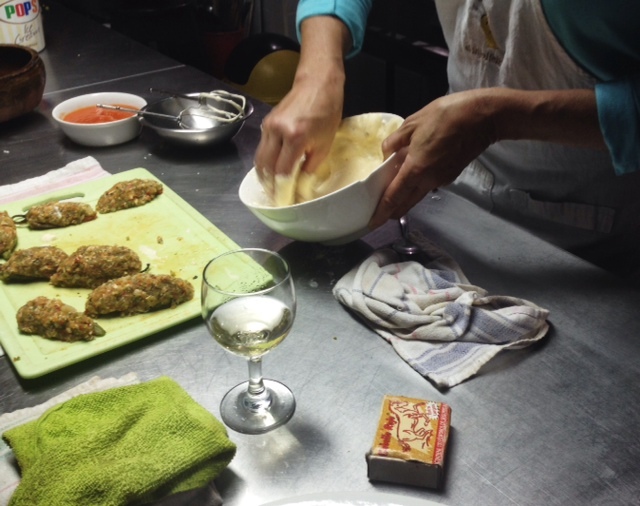 What a delightful surprise to arrive at Frijol Feliz and find they had signed up for the same cooking class. We swapped travel stories well after the food was done!